Different organisations of the garment workers demanded trial of the killing of one of their co-workers by police firing at Savar through separate protest rallies in front of the National Press Club on Wednesday. Garment Sramik Odhilkar Andolon (GSAO) organised its rally in front of the National Press Club with its head Moshrafa Mishu in the chair in the afternoon. Addressing the rally, the leaders of the GSAO alleged that the government has cheated garment workers through announcing a wage structure bypassing the opinion of the concerned wage commission. “Actually, the Labour Ministry arbitrarily declared the wage structure without taking the recommendations of the government-formed wage commission,” said Mishu. That’s why there are many anomalies coming out after implementation of the wage structure by garment factory owners, she observed, claiming that about 80 percent of garment workers saw their salaries actually decrease under this new structure, while salaries increased for only 20 percent of workers. 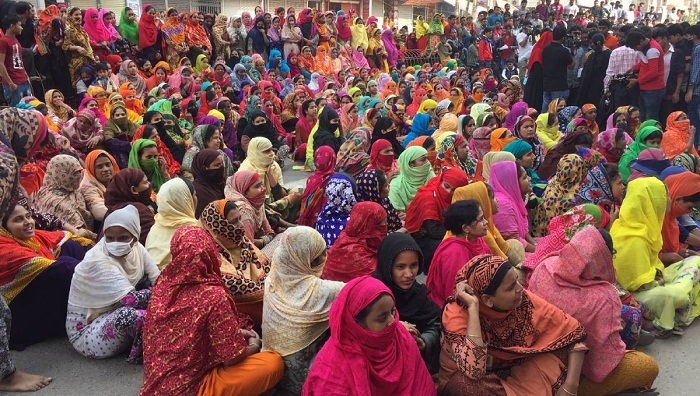 Calling on the government to review the wage structure and remove all anomalies within a month as per commitment, Mishu said otherwise garment workers will again come to the street to realize their just demands. She proposed a minimum monthly salary of Tk 16,000 for a garment worker. She also demanded the arrest of the police personnel who shot the garment worker dead during the protest in Savar and immediate trial. Earlier, Garment Sramik Trade Union Kendra (GSTUK), another organisation of the garment workers, also held rally in the same place. With advocate Montu Ghosh in the chair, different leaders of the GSTUK addressed and protested the killing of garment worker Sumon Miah, a worker of Anlima Apparels, by police firing in Savar on Tuesday.